1990 Two Evil Eyes Eleonora Segment: "The Black Cat"
1965 New York Television Theatre Barbara Fiers "The Drapes Come"
1973 Hawaii Five-O Betty Rowan "Murder Is a Taxing Affair"
1974 Toma Rita "The Big Dealers"
1974 Kojak Gloria "Cop in a Cage"
1975 Bronk Policewoman Haley / Billie "Open Contract", "The Fifth Victim"
1975 Petrocelli Joan Arnold "Too Many Alibis"
1976 Baretta Rita "The Left Hand of the Devil"
1976 Rookies, TheThe Rookies Carol Brenner "From Out of the Darkness"
1976 Captains and Kings Aggie "Chapter VIII"
1977 Three's Company Sally "Jack Looks for a Job"
1978 Kojak Shirley "May the Horse Be with You"
1978 Starsky & Hutch Greta Wren / Dora Pruitt "Photo Finish"
1978 Incredible Hulk, TheThe Incredible Hulk Margaret Hollinger "A Child in Need"
1978 Lou Grant Dr. Eilene Peterson "Slaughter"
1979 Visions Yvette "Ladies in Waiting"
1979 Supertrain Katherine Sully "A Very Formal Heist"
1979 Charlie's Angels Lonnie "Caged Angel"
1981 Charlie's Angels Laurie Archer "Taxi Angels"
1982 Lou Grant Vicky Doppler "Law"
1982 Insight Ruth "So Little Time"
1983 Falcon Crest Ella "Solitary Confinements", "The Betrayal"
1989 Trying Times Agripina Gravanescu-Smith "Death and Taxes"
1992 Ray Bradbury Theater, TheThe Ray Bradbury Theater Mary Morris "Zero Hour"
1992 Raven Flori "Flori and Dori"
1992–93 Roseanne Barbara Healy "It's No Place Like Home for the Holidays", "It's a Boy"
1993 Jack's Place Peg "Play It Again, Jack"
1994 Picture Windows Blossom "Song of Songs"
1995 Murder, She Wrote Evelyn Colby "The Scent of Murder"
1996 High Tide Matilda "The Curse of the High Tide"
1996 Goode Behavior Molly "Goode Golly, Miss Molly"
1997 Women: Stories of Passion Annie "Hotel Magic"
1997 Hunger, TheThe Hunger Mrs. Garington "Bridal Suite"
1999 Chicken Soup for the Soul Wanda "Simple Wooden Boxes"
2001 Strong Medicine Stella Riggs "Donors"
2001 Resurrection Blvd. Mrs. De La Vega "El Que Necesita"
2005 Wanted Sheila Beckwith "The Promise of Darkness"
2010 Criminal Minds May Walden "Reflection of Desire"
2011 Paul Cruz: Latin Actor (A Mockuseries) Sally Kirkland "Arrested No Development", "The Brother's Grim", "The Stereotype"
2014 Theatre Fantastique Louisa Mae "The Happy Home of the Murderous Mahones"
2017 Conversations in L.A. Evelyn James "First Step"
2017 Good Samaritans Olivia De Mills "What Do You Say We Get You a Puppy?" ↑ McNary, Dave (July 27, 2017). Sally Kirkland, Mel Novak Starring in Thriller ‘When It Rings’ (EXCLUSIVE). Penske Business Media, LLC. 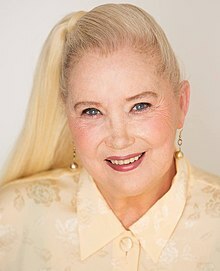 اینگیلیسجه ویکی‌پدیاسی‌نین ایشلدنلری طرفیندن یارانمیش«Sally Kirkland»، مقاله‌سیندن گؤتورولوبدور. ( ۲۱ دسامبر ۲۰۱۷ تاریخینده یوْخلانیلیبدیر). قارداش پروژه‌لرده سالی کرکلند گؤره داها آرتیق بیلگی‌لر تاپابیلرسینیز.